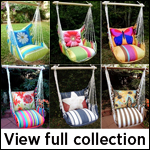 Garden and outdoor enthusiasts who enjoy decorating their outdoors with beautiful items will enjoy these sensational swinging hammock chairs. Designed in pastel colors of pink, green, and yellow, the prints include a variety of flowers, butterflies, birds, peacocks and rabbits. Enjoy the outdoors in a new way and curl up with a new book underneath the shade of a large tree in the yard. Designed to support up to 250 pounds, this unique chair features a 33 inch wooden spreader bar made of strong Chilean pine. 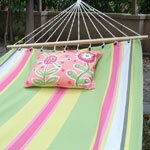 Ultra-comfortable cushions are created from weather and mildew resistant polyester that doesn't fade. The material also is machine washable for added durability. 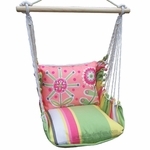 Entertain the guests of your outdoor party with this wonderful hammock chair and provide a chance for everyone to sit back, relax and be comfortable.